Find out which supplements can improve PCOS-and which ones to save your money on! CEUs are no longer available. *You must use a Mac or PC computer to view this webinar. This webinar is not compatible with ipad or mobile (iphone or android) devices. PCOS is one of the most under-recognized and under-treated medical conditions with numerous long-term health implications. This lecture will review the pathophysiology and diagnostic criteria of PCOS. New advances in nutrition therapy and practical lifestyle strategies for the health care professional will be discussed. 1. Participants will be able to name two medical conditions women with PCOS are at high risk for. 2. Participants will be able to recognize three medical nutrition therapy guidelines used to treat polycystic ovary syndrome. 3. Participants will be able to identify two effective nutritional supplements used to treat PCOS. 4. Participants will recognize the pathophysiology of PCOS. 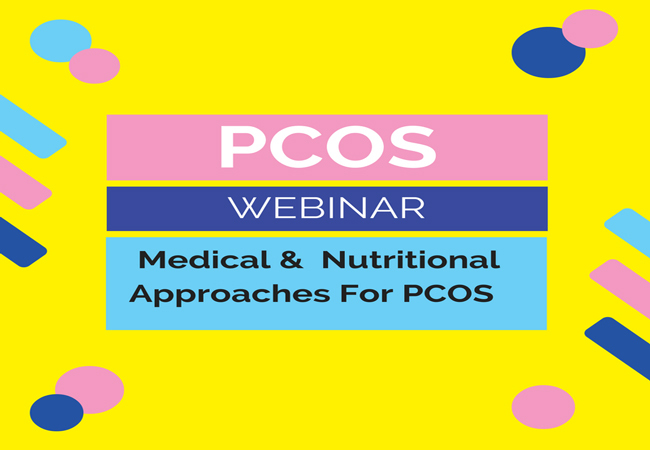 Join Dr. Theodore Friedman and Angela Grassi, MS, RDN of the PCOS Nutrition Center for an informative webinar on medical and nutritional approaches to polycystic ovarian syndrome (PCOS). PCOS is a common endocrine disorder of women that is characterized by irregular periods, infertility, difficulty losing weight, extra facial and body hair, hair thinning and high testosterone levels. Dr. Friedman will explain why PCOS occurs, how Endocrinologists make the diagnosis and medical treatments for PCOS. Angela will discuss supplements for PCOS including Resveratrol and Ovasitol (Inositol) as well as dietary approaches.